The idea of changing your routine can be a bit overwhelming. Think about the everyday routine of applying your makeup during the week. It’s pretty much another step to getting dressed. Then, before the start of the Sabbath, along with lots of cooking, preparing the children, and getting yourself ready, there is often the routine of applying “Shabbos” makeup. “Shabbos” makeup is usually applied just before the start of Shabbos, and it remains on the face for over twenty-five hours. During this time period, the foundation often falls into the little lines and wrinkles, drawing unwanted attention to what one intended to conceal; mascara starts to flake, leaving the appearance of dark circles under the eyes; and, as the lipstick wears unevenly, one’s lips appear chapped and dry. You may be thinking that there is no alternative, other than resorting to “long-lasting” makeup. This was once true, but times have changes. Sleeping with a full application of makeup on Friday night is no longer the only option. In all my years doing makeup, I have yet to see an alleged product which promises to be the longest lasting, highest quality, and at the greatest price remain on the face for twenty-five hours and not actually appear that way. I’m often told that making the change to all-powder Shabbos makeup is just too daunting since “I have my routine.” However, I have good news: your life has been made easier! Instead of having to scrape away at your long-lasting weekday makeup and apply as much as possible, as though you’re frosting a cake, there is finally all-powder makeup available for Shabbos. Even better, you can also find both powder blush and powder foundation available in spray bottles. People also ask me how to choose colors for their powder makeup. This is a great question, since the color intensity of loose powder makeup can be especially bright in the packaging. Bear in mind that the actual intensity of the color is significantly minimized once it is applied to the skin. This goes for all powder products. Colors with a bit of shimmer work best to accent and enhance our various features. Also, in most instances, loose powder Shabbos makeup is being applied to skin which has had a light dusting of spray oil, therefore it does not have a lot to adhere to. That’s why colors need to be closer to the true tone, rather than muddy or muted, since powder products unevenly absorb into the skin, leaving blotchy spots. Application order should always start at the top and go to the bottom—on Shabbos or any other time. Another easy aspect of loose powder Shabbos makeup is that each product has its own designated brush, which is especially good given the retouches one might need throughout the day. 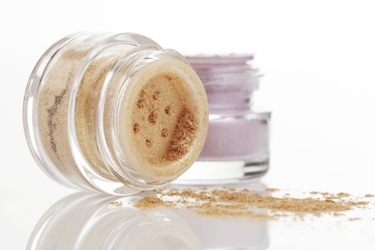 The key to making a smooth transition to loose powder makeup is to keep expectations realistic. You’ve got a product of a different consistency than you’re used to, unique application techniques and a lasting ability unlike before. Your life can really be made easier with less pressure on preparation for Shabbos and a look and feel like a new Shabbos bride. is the CEO of Shabbos Shimmer, which offers Jewish observant women a high-quality all-powder makeup that is Rabbinically-approved for use on Shabbos. Maintaining Halachic standards, Shabbos Shimmer satisfies both religious and fashion concerns. Dubbed as “The Gold Standard of Shabbos Makeup”, Shabbos Shimmer is modest, yet modern, and has made women’s lives easier by keeping them from having to scrape off eye shadows before Shabbos or sleep with makeup already applied to their faces on Friday night. Nancy has extensive background working with models on photo shoots in New York, Paris, Milan and London, which has inspired her to make colors that enhance and complement skin tones and facial features of all ages.